This week has been a busy one for me! Between work and life in general there hasn’t been all that much time for gaming. Luckily I’ve managed to keep up with the most recent events unraveling in our geeky game filled world, managing to play a few hours of Life is Strange 2 and keeping up with the fallout of Fallout 76. Still with the weekend on the way I wanted to do a more light hearted post. So today I’m covering the top 3 Twitch Streams I always watch. There are many great streamers on Twitch some big and some small and I have huge admiration for anyone who streams regularly because it’s not easy. The streamers in my top three are all larger streamers but I want you to share some of your favourite streamers in the comments whether they are big or small! And if you’re a streamer share your channel in the comments too! I love finding new passionate gamers and geeks to watch. First up we have Critical Role. Critical Role is a Dungeons and Dragons stream with a recurring cast of amazing voice actors many of who have played some iconic video game characters in their time. Critical Role is more than just a game of DnD, I quickly found myself engrossed in the world and attached to the characters. The story is amazingly well planned (Matthew Mercer is a very talented DM) and every Friday I sit down with a cuppa to laugh, cry and scream as the story unfolds. Critical Role is on Thursdays 7pm Pacific Time so being in the UK that’s 3am so I always wait until the next day to watch! Into its second Campaign set in the region of Wild Mount you don’t need to have seen Campaign one to jump into the 2nd one as the characters are brand new and they are a continent away. Saying that with 44 episodes to Campaign 2 (I started on episode 23) there’s a lot of content to cover as you follow the adventures know as The Mighty Nein on their quests across the Empire and beyond! If you haven’t checked it out already I would highly recommend giving the show a go. It’s not just a game of DnD its a chance to watch a story with rich complex characters tackling some insane challenges unfold before your eyes. If that doesn’t motivate you then their new intro video just might! High Rollers is the second DnD stream on my list and was the first one I ever watched. Its thanks to High Rollers that I decided to give DnD a go and that I heard of Critical Role in the first place. High Rollers is a weekly DnD stream on every Sunday at 5:00pm (UK Time) and is made up of a cast of streamers/youtubers from the Yogscast. High Rollers is a great stream through which I picked up a lot of my understanding of DnD, its rules and how it works. I found High Rollers really easy to get into with a great story and cast that I have easily become invested in. The first High Rollers campaign has now came to an end, I have watch every episode and the climax had me on the edge of my seat! The new High Rollers campaign Aerois has started this year and will take a lot less watching the Critical Role to get caught up on. Aerois is set in a homebrew (home-made) world of magic and fantasy but with a sci fi/steam punk flair with floating cities and strange technologies and travelers from other worlds. 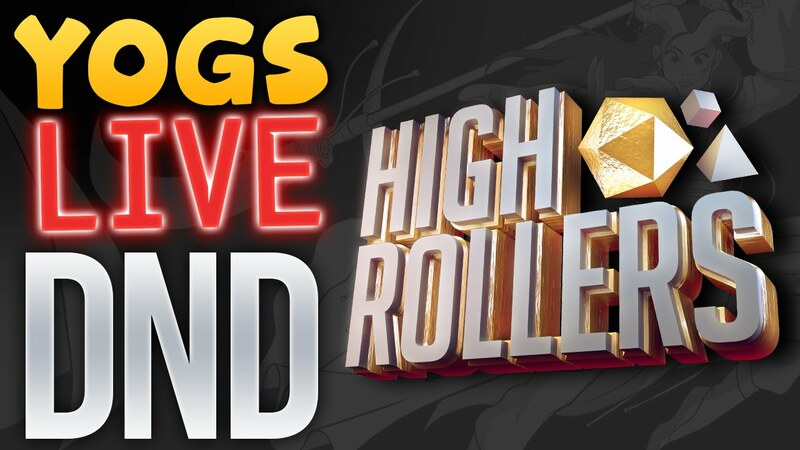 I would definately recogmend checking out High Rollers if you want to watch a DnD stream but either have never played the game or don’t know where to start they are really easy to get into. Finally we have the Yogscast. Now I supose I may be cheating a little bit here as High Rollers is part of the Yogscast but in general the streams are broadly very different. I grew up watching the Yogscast from their early days of Minecraft on Youtube to the present. With multiple channles and a wide veriaty of games and personalities I find them a source of endless fun and enjoyment to watch. They are a fairly big and wellknown group so I won’t say too much (they don’t need me for that). Their streams are always interesting but what realy makes them stand out for me is their annual Jingle Jam. Each year they stream on Twitch every day of December using Humble bundle to raise money for a number of amazing charities! As of 7th December they have raised over £1million for charities this year including: Special Effect, Mental Health Foundation, Stand Up To Cancer and tonnes more. Not to mention when you donate you can choose a charity of your choice. You can donate here: HumbleBundleand you get some cool games as well. These are just my top three Twitch Streamers who I watch on a regular basis. But there are so many amazing ones out there that I either haven’t got round to watching or haven’t heard of. In the comments below share some of your favourite Streamers! If you enjoyed this post feel free to visit the Clan again, I post every Monday, Wednesday and Friday! Prev What Do You Think? Is Gaming Changing For Better or Worse?